After the successful launch of Samsung S4, the company is all set to launch few more devices in the market. Few days back we have covered the announcement of the company about the launch of Samsung galaxy core and now the company has officially announced the third iteration of its Samsung’s Android tablet. The company at its official site has announced the Samsung Galaxy Tab 3 which is again a bigger display device, will be coming soon in the market. 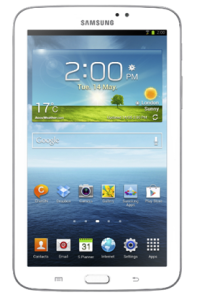 The device announced few days back, Samsung Galaxy core, was an average display device with 4.3 inch screen, but this galaxy tab 3 will be featured with 7 inch screen. As name suggest, this device is third in the galaxy tab series and the successor of Galaxy Tab 2. This Korean manufacture has a tablet in almost every possible size – 7.7-inch, 8.9-inch, and 10.1-inch and now with this new GALAXY Tab 3, Samsung has evolved its range of innovative tablets, making them smaller and easier to carry. If we compare this device with its predecessor, the Samsung Galaxy Tab 3 7.0 is more compact and lighter, as it will be coming with the dimension of 188.0 x 111.1 x 9.9mm which indicated the device will be slim and will be just 9.9mm thick weighting 306gms, than the Tab 2 which has thickness of 10.5mm with the dimension of 193.7 x 122.4 x 10.5 mm and weighting 345g. The company’s tab 7.0 plus share the same thickness with the device but it is heavier than tab 3 with the weight of 345gm. Also we have observed that last year’s Galaxy Tab 2 came in two version i.e. in 7 inch and 10.1-inch versions but this year’s model is still declared in just one size. Apart from this internal competition, the Tab 3 is most certain to compete against its most likely rival Apple’s ipad mini and the Nexus 7 which has recently gain a popularity in the market. The Tab 3 has a screen resolution of 1,024×600, which is lower than the Nexus 7’s 1,280×800 pixel count and hence tab 3 losses the point in the display. Also if we check the performance than tab 3 has got a 1.2GHz dual-core processor, which is slightly speedier than its predecessor, but not as powerful as the quad-core processor provided inside the Nexus 7 and again here the tab 3 lack behind. One more drawback in this new version of Galaxy Tab is the operating system which is still Android 4.1 when we already have Android 4.2.2 in phones like Samsung Galaxy S4 and HTC One. So we see very few to vote for this device but still if the device come with the reasonable price tag with some good price difference with the high range device like Nexux 7 , HTC one then surely I can look twice at the device. If we come to the hardware design , Galaxy Tab 3 brings the familiar S4 styling and is announced to be coming in Wi-Fi and 3G versions, with the 3G version being fully voice call capable. As we have discussed in our previous news about the Galaxy Tab 3 , the device have conventional look of a phone, with 2 soft keys and one hard key in the center bottom of the front panel acting as the Home button. It has the body dimension of 188.0 x 111.1 x 9.9mm with the weight of just 306gms. Samsung Galaxy Tab 3 will have 7 inch WSVGA (600 x 1024) TFT screen which is not different for the Samsung device and suggests it’s likely to be a keenly-priced slate,. From the technical front, the device will be powered by a 1.2 GHz dual-core processor which will get the support of 1GB RAM. It has 8/16GB of built-in storage which can be expandable via the microSD card slot. Also the Tab 3 operated 4.1 which is not the latest version and hence bit upsetting. The device will be featured with 3-megapixel camera rear camera for better photography experience and 1.3 -megapixel front camera for video calling.. It is also designed to support the basic connectivity including dual-band Wi-F a/b/g/n and Bluetooth 3.0. To run all this, the device will get the substantial power of 4,000mAh battery. From the technical specs the device doesn’t looks so impressive but it’s possible that the Samsung might be targeting the lower end of the market with the Galaxy Tab 3. I will not comment on the worthiness of the device until the device gets it price tag. Also there is no word from the company on the availability of the device apart from the previous statement that one version will be globally launched in the month of May and this version will be only equipped with WiFi and the 3G version of this tablet will come in late June. We are having our eye on the updates and will provide you the update on the availability and the price of the device as soon as we hear on this from the company.